(known simply as Nemesh) was born on the 14th May 1963 in Petrovaradin, the former Yugoslavia (Serbia now). Since early childhood he manifested exceptional drawing skills and interest in drawing especially comics; which naturally progressed into more detailed and graphic representations. His artistic direction however was about to change when in his early twenties a schoolmate commissioned him to create a large oil painting, an event that ultimately lead him onto an artistic path he has been on ever since. Having only been painting for a few years Nemesh was fortunate enough to win several local art awards; events which ultimately gave him the encouragement him to pursue a career as an artist, a decision he has never looked back from. Events were also about to take a positive change for him and many other artists when in the early nineties there was a sudden reform in former Yugoslavia which saw a number of new private art galleries open. This fundamental change offered Nemesh an opportunity to start building his artistic career but sadly this opportunity would be short lived as civil war soon broke out which eventually saw the breakdown of the entire country. Yet even as the country was going through this very difficult time Nemesh was still able to experience great local success with his art. However in 1993 with the war still raging; Nemesh decided that he and his former wife needed to leave the country and start a new life elsewhere. They decided on New Zealand as their new home due to its temperate climates and beautiful scenery, yet as we all know any move has its challenges and for Nemesh this meant him having to let go of his local artistic successes and start his career from the very beginning again in a brand new country. It took Nemesh about a year to become settled with his new life in New Zealand so in between his art work he also decided to focus some time and energy on his computing education so signed himself onto a 6 month graphical design and publishing course. Today his artistic career spans over 30 years since he first put his drawings and sketches into a local exhibition in back in 1984 (in former Yugoslavia). Nemesh has participated in more than 300 group exhibitions in New Zealand and overseas and has had more than 50 solo exhibitions in the former Yugoslavia, Sri Lanka, USA and New Zealand. In 1989 and 1991 as a young and already recognized artist he was elected and sent twice to participate in the Art Colony “17 Watermills” in Dusnik near Nis in Serbia (when it was still part of former Yugoslavia). In 2015 he was invited to participate in the exhibition for the Matariki Celebration in Rotorua where he was the ‘artist in residence’ for a period of two weeks. 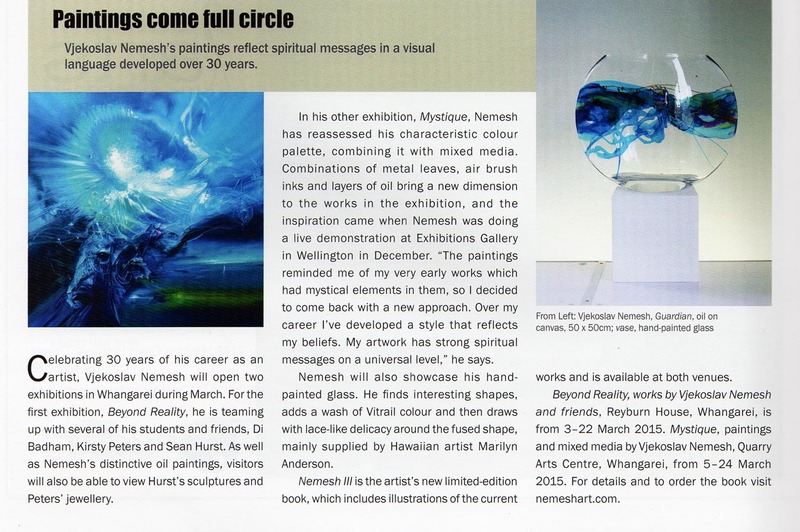 For the last 19 years Nemesh has also had annual solo exhibitions in Sargent’s Fine Art in Lahaina, Maui Island in Hawaii, USA and from 1995 to 2014 he was participating in Peter Reynolds Christmas exhibitions, 8 of these years has seen him doing live public demos in this gallery since its initial opening. Together with his close friends Nemesh have organized seven ‘Interconnection exhibitions’ around New Zealand, the idea behind this Interconnection being “to utilize a collaborative approach with other artists, exchange ideas and create works which will differ from the artists usual style”. Nemesh has had his work presented in collections throughout Europe, Russia, Britain, U.S.A., Canada, Australia, Asia, and New Zealand and has established world-wide recognition for his unique, authentic and visionary artistic style of work. “Carried away by unrestrained wave of creativity, he achieves a perfect blend and unique harmony between the worlds of imagination and reality. The overwhelming magnificence of nature’s creation inspires him to explore the depths of his soul, where conscious meets unconscious; his art moves the boundaries of light and darkness, it grasps to reach that blurred distance of celestial mystery. Led by an innate painting passion, he is using the whole spectrum of colours, harmonizing colour with wonderful ease.